December, 2013 | H&R Group K.K. 〇：English speaking doctor is available. △：No English speaking doctor available. – All clinic doctors are female. – Please bring a female interpreter if possible. One great thing about living in Japan is the food; even healthy fast food is available, and quite tasty! Walk right past the heavily processed American fast food chains and see what Japan has to offer! Just because it’s fast does not mean it’s not healthy. The good old rice-ball usually covered with sea-weed, assembling one from the plastic wrap in the convenience store is always the first complicated task an expatriate has to master. However, if you have a choice then stay away from the ones in the convenience store and go for the hand-made (tezukuri) ones that you can buy in Mom-and-Pop shops or even specialty onigiri shops. The ingredients used are always that much fresher, and free of chemicals. Not exactly the picture of health, it still beats a hamburger hands down because it’s been freshly made from “real” ingredients. Add a raw egg and mix it around for great texture and extra protein. It’s so cheap, too, so it’s the staple food of many otherwise starving students and lower income workers. Japanese curry is very different from its Indian counterpart, but it’s still chock full of great ingredients and there are several chains like Koko Ichiban that will serve you a plate of hot steaming curry rice in no time at all. Most westerners are already familiar with the little circular tracks that carry sushi around in front of customers who can pick out what they like. There are cheaper shops and more expensive ones, but one thing all the sushi shops have in common is that they serve healthy food, fast! This is the only large Japanese hamburger chain. Unlike its western counterparts, hamburgers are made from scratch each time they are ordered and so it takes more time than you’re traditionally used to, and they’re also more expensive than a western fast food chain. There are also funny and strange Japanese ways of combining ingredients – hamburgers made with rice, green tea thick shakes etc. 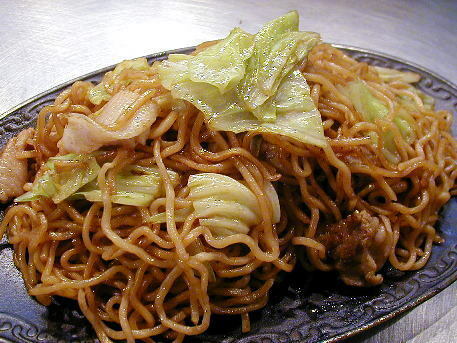 Ramen noodles have a cult following, even overseas. If you want to become a member of this cult, check out the Japanese movie Tampopo for a serious education in the art of the ramen noodle! Ramen is popular late at night when people have been drinking, and one good benefit of it is that it kind of takes the edge off the alcohol and you get some nutrition before you sleep, making the next morning hopefully more bearable. This white, thick, wheat-based noodle is a must know for the budget concious traveler. The soup is often fish based, and the ingredients are usually very healthy. A personal favourite is tsukimi udon (or “moon viewing udon”), which gets its name from the raw egg that is dropped in and cooks partially in the hot broth. This thin noodle is darker in colour because it is made from buckwheat. It is on the shopping list of any serious dieter, because it is high in fibre and low in calories. 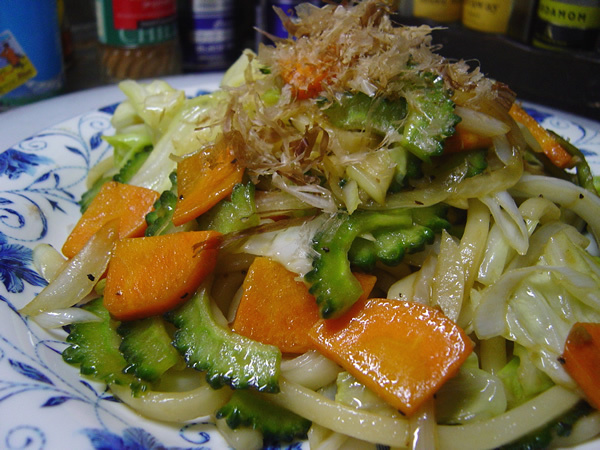 It can be served hot or cold, or with vegetables, called sansai soba. These cold noodles are a great summer lunch, both filling and refreshing at the same time. They are dipped into a soup, and you can add condiments such as ginger or wasabi to the dipping soup for flavour. These noodles cooked on a hot plate are often sold at roadside stalls such as at festivals. Meat and vegetables mixed in with the noodles make these a good choice for nutrition, but watch how much oil is being used in the preparation before you buy. A Donburi is anything that is heaped up on a big bowl of rice. This is what makes it so fast to serve – they literally just dish out the rice and then the topping. Beware of overeating! A form of donburi which gets its name (“Parent-Child Donburi”) from its main ingredients, chicken and eggs. It’s a good source of protein, but perhaps go easy on the rice. Another form of donburi which heaps up vegetables and seafood (primarily) done in tempura batter. I find tempura very “hit and miss”, in that well-made tempura will not leave you with a greasy feeling, but the bad stuff does go down very heavily. My recommendation would be to have expensive ten-don the first time you partake. Oden is basically just a whole lot of ingredients (vegetables, eggs, chicken) boiled up in a broth waiting for the customer to come and pick out the bits he or she wants. You can get it at convenience stores during winter or at roadside stalls called yatai. Everybody knows this Japanese chicken-on-a-stick contribution to the world cuisine. You don’t have to stick to chicken, either. There are shops that specialize in “things on sticks”, called kushiyaki and the stuff is ready very quickly as they don’t take long to cook through. Sometimes referred to as “Japanese pizza”, it’s actually more like a Japanese pancake which is made of a floury mix, cabbage and eggs among other ingredients. Okonomiyaki is the meibutsu of both Osaka and Hiroshima, although each region cooks it differently. Related to okonomiyaki by the floury dough, these little balls have bits of octopus inside them making them instantly unpopular with people who don’t like chewy bits in their dough. However, even though they are an acquired taste for some, they are a reasonably healthy, reasonably priced and delicious fast food that go well with anything. In a world where mothers more often go outside the home to work, packed dinner shops or bentoya have sprouted up all over Japan. You can get a well balanced meal in minutes! Hokka Hokka Tei is one of the most prolific bento chains, and you can probably find one in your neighbourhood for those nights you just can’t face cooking. With the completion of the JR Central Towers, at the end of 1999, Nakamura-ku has regained its status as the city center from Naka-ku, and slowly but surely the area has attracted a great deal more restaurants and department stores. The Midland Square building, built to house the offices of The Toyota Motor Corporation is a mammoth structure that contains upscale clothing boutiques, high-end restaurants and one of the city’s biggest multiplex theaters. Nakamura Ward is also famous as the birthplace of Toyotomi Hideyoshi. – Parking spaces for 8 cars available. – Doctor can speak both English and Korean. The river after which this ward is titled, the Nakagawa, is just one of seven that flows through Nakagawa-ku. Thanks to this accessibility as well as canals and connections to Nagoya port, the ward has long been a centre of industrial and productive strength, with woodworks and ironworks as well as regular commerce serving as important employers to the area. This continues today as the National Highway 1 is easily accessible as well as the Tomei Osaka Motorway running east to west. – Please arrive no later than 30 minutes before the reception closes. – 2 minutes walk from Sakae station (Exit 5).